GreenWave Energy Solutions, an “alternative energy startup has been granted a three-year preliminary permit to study wave energy off Mendocino. It’s locals’ first look at action by a newly recast Federal Energy Regulatory Commission (FERC), which is tasked by the Obama Administration to make a greater push to develop alternative energy. On May 1, FERC issued an exclusive preliminary permit to GreenWave Energy Solutions LLC. The permit’s area stretches from just north of Albion to off Point Cabrillo, about a half-mile from shore to three miles offshore. Strickland, one of the state’s most ardent deregulators and anti-tax advocates, won the state Legislature’s closest race last November by a handful of votes. He made his involvement in alternative energy a key part of his campaign. Green Wave Energy Solutions is composed of president Wayne Burkamp, Strickland, engineer Bill Bustamante, developer Dean Kunicki and developer Gary Gorian. Kunicki and Gorian are major real estate developers in Southern California. “The GreenWave proposal envisions eventual construction of a power plant with more than twice the capacity of that planned by PG&E. GreenWave’s Burkamp said the firm is not a shell corporation or a subsidiary of any other company. GreenWave hopes to someday install 10 to 100 Pelamis or OPT hydrokinetic devices capable of producing 100 megawatts, with a 2- to 3-mile long powerline running to shore, the permit application states. FERC’s permit conditions for GreenWave don’t vary much from those imposed by FERC under the former Bush Administration. But locals made this preliminary permit one of the longest ever. And the application has more interveners and more people commenting than any other “hydrokinetic” project in the nation. FERC has issued and is considering hydrokinetic permits from the Yukon River to the Florida Keys for wave, tidal, ocean current and river flow power. While issuing the permit, FERC briefly responds to each point raised by locals. Although FERC is an independent agency, President Obama appointed Jon Wellinghoff as chairman of the five-member commission after the chairman under President Bush resigned and left FERC. With the commission now split 2-2 between Republicans and Democrats, Obama now has the opportunity to change its direction with his appointment of a new fifth member. FERC also recently accepted three preliminary permit applications from Sonoma County to study wave energy off its shores, a nod to local government that signals a change of direction for the independent federal commission. That change began when Mendocino County and the City of Fort Bragg protested exclusion from the process and a lawsuit was threatened. 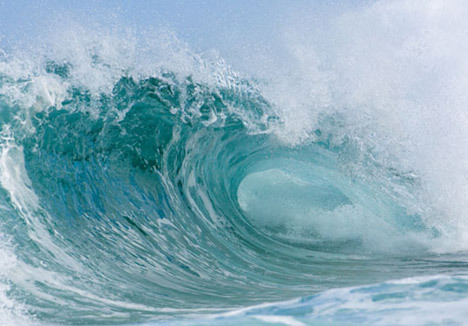 The permit is the first wave energy permit since the Obama Administration released new standards for the process of generating alternative energy on the outer continental shelf. Under that plan, FERC has complete control of the wave energy process inside three miles. For projects like PG&E’s wave energy proposal, which extends on both sides of the three-mile line, a Minerals Management Service lease is required past state waters. PG&E withdrew from its efforts to get a MMS lease last year. GreenWave’s permit area appears to extend just beyond the three-mile limit. John Romero of MMS said neither PG&E or GreenWave has sought a lease from MMS. GreenWave’s application says the initial phase will involve spending between $1 million and $2 million and will be financed entirely through private equity. “The estimated cost of the second phase (the actual installation of wave energy devices in the water and the generation of power from these devices) will be $20 million to $40 million,” the application states. Burkamp told the newspaper that GreenWave’s application is different from PG&E’s in that GreenWave will focus on solving environmental issues, while PG&E Wave Connect is set up to test rival technologies. In July, a Pelamis wave power generator, an articulated steel machine like a giant semi-submerged sausage, was towed into the deep Atlantic, off the coast of Aguçadoura in northern Portugal, and attached to a floating mooring. 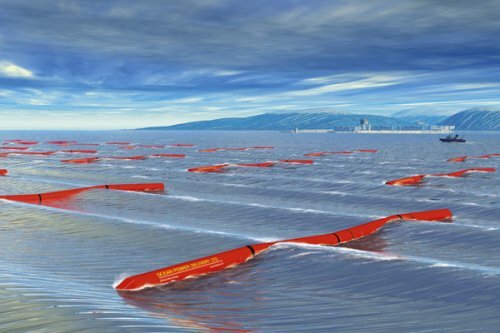 By September, two more Pelamis units, each capable of generating 750 kilowatts of electricity, had joined the first, about three miles, or five kilometers, off shore, and the Portuguese power utility Energias de Portugal was able to announce proudly that “the world’s first commercial wave power project,” was transmitting electricity to the national grid. Costing about 9 million, or $11.5 million, the three machines were the first phase of a plan intended ultimately to be expanded to 28 units, with a total generating capacity of 21 megawatts  enough to power more than 15,000 homes and save more than 60,000 tons a year of carbon dioxide from being spewed into the skies by conventional power plants. In mid-November all three were disconnected and towed back to land, where they now lie in Leixões harbor, near the city of Porto, with no date set for their return to operation. First, there was a buoyancy problem, said Max Carcas, a spokesman for Pelamis Wave Power, the British company that designed and built the units and retained a 23% stake in the project. According to a report on ocean energy systems published by the International Energy Agency, foam-filled buoyancy tanks for the mooring installation leaked and needed to be replaced, delaying startup. Then, the financial crisis kicked in. 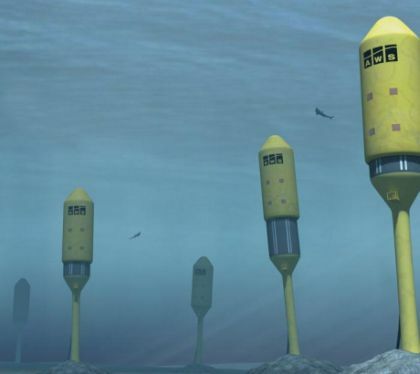 The Aguçadoura wave farm was announced in September as a joint venture between Pelamis and a group of three promoters including EDP, the Portuguese electrical engineering company Efacec, and the asset manager Babcock & Brown, an Australia-based specialist in power and other infrastructure investments. But, by November, as the global credit crunch and falling share markets took a deepening toll of highly leveraged investors, Babcock & Brown announced a major program of asset sales to pay down its debt: and the Portuguese partners pulled back from the venture. Against that background, Mr. Carcas, of Pelamis, said that there was no timetable for returning the generators to sea. Harnessing ocean power for energy seemed an ideal option for Portugal, a small country with no oil and limited resources, and a long Atlantic coastline south of the Bay of Biscay, famed for its fierce waves and storms. Portugal now imports more than 80% of its energy supplies, far above the European Union average. Domestic power generation is heavily dependent on hydroelectric projects, which are vulnerable to big fluctuations in output, depending on seasonal weather conditions. Ambitious government plans still aim for a radical transformation of Portugal’s energy profile, with as much as 60% of the country’s electricity to be generated from renewable sources by 2020. That compares with an EU target of 20% for the union as a whole. But the Aguçadoura project points up the risks of a strategy relying on cutting-edge, and potentially costly, technology. Whether or not the target is achievable, particularly in current economic conditions, is a subject of debate among the country’s renewable energy specialists. “We assumed there would be no critical technical issues,” to hinder deployment of offshore generators, said Antonio Sarmento, director of the Wave Energy Center, WavEC, a Portuguese nonprofit organization that promotes ocean wave power generation. On the cost side, investments in ocean-based technologies “are very high and operating costs are not entirely negligible because you have the problem of corrosion from salt water,” said Colette Lewiner, head of the global energy and utilities sector at the French consultancy and services company Capgemini. While the Aguçadoura partners put the cost of the first phase at a relatively modest 9 million, the true cost of such developments is difficult to calculate, said Hugo Chandler, a renewable energy analyst at the International Energy Agency in Paris. Still, the Aguçadoura experience has not discouraged EDP from pursuing other high-tech ocean solutions. Last month it signed an agreement with Principle Power of the United States to develop and install a floating offshore wind farm off the Portuguese coast, one of the first projects of its kind in Europe. The project would use proprietary Principle Power technology designed to allow wind turbines to be set in high-wind but previously inaccessible ocean locations where water depth exceeds 50 meters, or 164 feet. The agreement foresees commercial deployment in three phases, but sets no timetable. Offshore wind power generation currently costs 50% to 100% more than equivalent onshore wind farms, according to a recent Capgemini report on clean technologies in Europe. But Portugal is eager to press ahead with the new technology. “Offshore wind is one of our key innovation priorities,” said the chief executive of EDP, António Mexia. “The development of floating foundations for wind turbines is a prerequisite to the development of offshore wind farms world-wide, as areas in which the sea bed is less than 50 meters deep are scarce and fixed structures in deeper waters are economically not feasible,” he said. A 30 million first phase, covering development and infrastructure construction, could see a small, five megawatt floating generator in operation by the second half of 2012. But for that to happen, full funding would need to be in place “by the end of this semester,” Mr. Mexia said. WavEC, meanwhile, has several wave power projects in the pipeline, including tests of prototype systems from three companies  WaveRoller, of Finland; Ocean Power Technologies of the United States; and Wavebob, of Ireland. 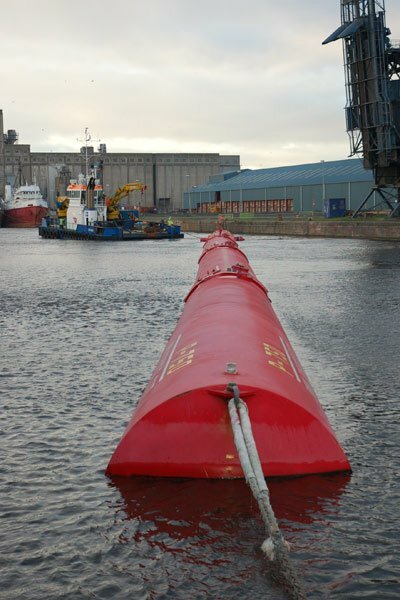 Edinburgh-based Pelamis Wave Power has won an order from UK renewable energy generator E.On for the next generation Pelamis Wave Energy Converter, known as the P2. The P2 will be built at the Pelamis Leith Docks facility and trialed at the European Marine Energy Centre (EMEC) in Orkney. This is the first time a major utility has ordered a wave energy converter for installation in the UK and the first time the Pelamis P2 machine will be tested anywhere in the world. Pelamis already has the world’s first multi-unit wave farm operational some 5km off the north coast of Portugal at Agucadora, where three 750kW machines deliver 2.25MW of electricity to the Portuguese grid. Operator Enersis has issued a letter of intent to Pelamis for a further 20MW of capacity to expand the successful project. Licenses, consents and funding have been granted for the Orcadian Wave Farm, which will consist of four Pelamis generators supplied to ScottishPower Renewables. This installation, also at EMEC, will utilise existing electrical subsea cables, substation and grid connection. Funding and consent has also been granted for Wave Hub, a wave energy test facility 15km off the north coast of Cornwall UK which is expected to be commissioned this year. It will consist of four separate berths, each capable of exporting 5MW of wave generated electricity. Ocean Prospect has secured exclusive access to one of the Wave Hub berths for the connection of multiple Pelamis devices.